While this starts 40 years ago as a young child, Modelmayhem has made decisions to take part in ending my life, showing they are not about making money and business. Exerting huge amounts of time, energy, resources invested in ending my life and trying to cover up the larger crimes with the Government and Police. When approached by people with authority and the police, and asked to become a vigilantes, they made a moral decision to try to act as the police to end my life to stop me from talking about what I know and found out was going on at 29 years old with Mike Huntley sent after me at 14 years old, and Tom Farley around 8 years old. All the things they were involved in with covert psychological terror/torture, defaming, slandering, libeling my name worldwide working with Aubry fisher telling me I should use their site instead of others when she saw I was getting into Studio Photography. Introduced to me by Rodie Morales sent after me by the LAPD taking me to strip clubs to try to scare me into coerced false confessions that I have killed someone with LAPD. She was told to befriend me and hunt and Stalk me. Recently after about 6 years of not even thinking about photography from what they are involved in. I tried to sign up 7/11/2018 and instantly they knew me in their operations with cover up excuses that they won't let me work with people because they banned me. Trying to cover up the real reasons of what they are doing and are involved in. Not only do they work on me now with >WORLDWIDE support. They never stop, pretending they don't know me. And then they follow me from place to place worldwide sabotaging every thing I am trying to do. Weather it's a website, public place, you name it. Trying to figure out ways to end my life of rid me of the world. Showing that this is PERSONAL, and not really about anything I've done wrong. After signing up to ModelMayehm.com they used their entire website, and user base to take turns on me all day and night to destroy my name, try to make me mentally ill and kill me. Then trying to cover it up like usual, by banning me. Saying I am involved in some kind of inappropriate behavior along with their other endless lie spree and the rest of the world. of the world.of the world. of the world. Recently their hunt with the people they are associated is still going on, as I was thrown into Maximum Security prison for a girl who called herself Lilly Love, They sent after me, along with other women I did photo shoots with working the same elaborate angles. While the toy gun in the picture does incriminate my father and the LAPD in their endless crime spree against me. 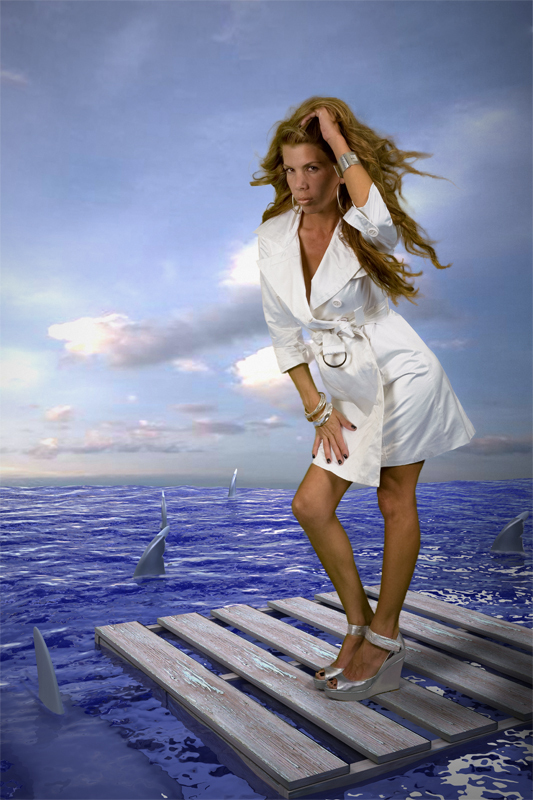 Modelmeyhem are supporters of singling and out stalking people who sign up to their system. Notifying their entire user base to take part. Destroy peoples names and lives to rid them of the world. 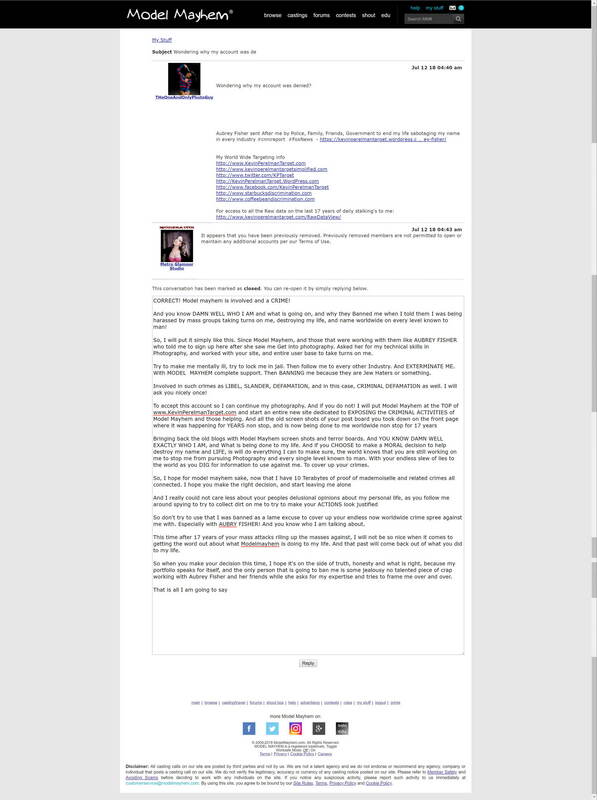 Modelmayhem.com had about 750,000 users working on me at the time they banned my account because I told them what was being one to me, and they didn't want me talking as they took part in it showing the people who ran the site were working with Aubrey Fisher and are heavily in involved in these mass stalking operations. The majority of them have been told to harass me to DEATH, Literally. From day one of signing up and doing what everyone is supposed to do, comment on others works, give feedback, or shutouts, etc. But in return for me doing what the site says it's about, and clearly it isn't, I've been attacked by the majority of the users and even the support team when either addressing the issue over and over, or just trying to promote my work and pursue that avenue. Not only that, but a large majority of the users we following me around and collecting information to use to create mental illness and run me out of public places, as well as give out website information to public locations not even related to this field. This screen cap shows one of their terror tactics. At one point modelmayhem.com told the majority of their user base to post in patterns of 1,2,3,4,or 5 and in other ways with hinting messages to create mental illness. You will notice things like explanation points done in patterns of 2,3,4,5 for example "!!" or "!!!" or "???" Even hinting messages about my private life, for example, if I go to Mcdonalds, someone will post on the site, "I love Mcdonalds" or If I go get donuts, someone might post something like "I need a donut" instantly. And this was done over and over until it was beyond a reasonable doubt and is still going on. Or they would take fragments of things I posted copying them over and over all day and night for example, If I jokingly post ya'll, it will be posted back all day and night to create mental illness and such tactics like this. This shows you what's been going on all day and night I'm guess for about 10 yrs or so with the intent not only to run me out of the business, but to end and destroy my life refusing to stop until I was dead. They would try to justify their actions by saying things like, "If you are not comfortable here, then you shouldn't use our site"
One of the women who contacted me on their system who called herself Lilly Love at the time. I believe a Christina something. Who used the toy gum as I prop. In a photo shoot. After this, I was hunted by the LAPD because the toy gun incriminated by father in trying to get coerced false confessions that I had tried to kill or scare him. Because at 16 years old. He was mad at me for something and put the bullet hole in his Mercedes 300e telling the world I did it. While this is just one of endless operations like this. Model Mayhem is not only helping them cover it up. But also hunting me with Rodie Morales, Tom Farley, Lorena Escobar, Aubry Fisher, Mike Huntley in these operations and told to work on tactics to try to make me look like a VIolent Paranoid Schizophrenic. Rodie Morales who was also working with Woemn in operations to try to make it look like I was stalking them and taking me to strip clubs. Also on worldwide accusations that I have killed someone and, introducing me to Aubry Fisher, who reffered me to Modelmayhem.com working with them in these Stalking Operations. 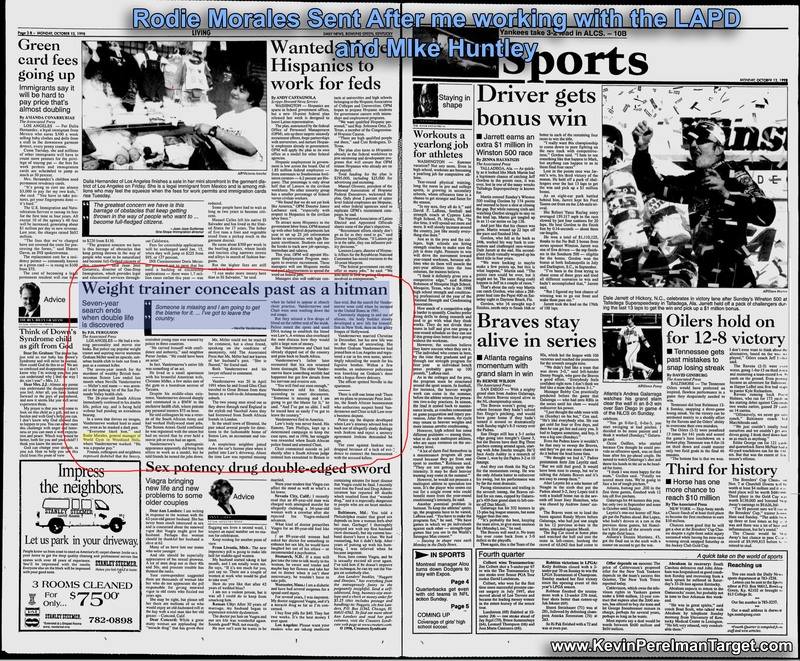 As you can see from this News Paper clipping with Rodie Morales working on Murder Investigations and the LAPD. Associated with Modelmayhems illegal operaitons. Just one of the many people sent after me by the police and government in frame job operations. Mike Huntley wanted me to join the Gym with him as Rodie Morales signed up our memberships. 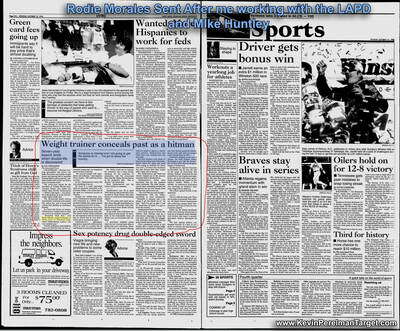 Rodie then befriended me in all sorts of setup attempts and frame jobs working with the LAPD. Notice how in 1998 Rodie is involved with working with the police, but he posed as a person who wanted to build adult websites as he already knew I had built some and was working on a database system for some larger scale websites. Rodie was just one out of 4 people from the age 21 - 27, in each state I lived in, befriending me, and wanting to take me to stripe clubs working the same exact angles and tactics. Eric Christianson, Val Morozav, Rodie Morales, Tom Farley. Which seem to link to my mother oddly enough accusing me at around 14 - 16, or rather asking me, if I had hit our neighbor kid in the head with a golf club named Josh Burnam. As I recall Tim Thompson in my office pretending to swing a golf club, as Mike Huntley was pretty much going off on me in our office changing from friend to my executioner in his 25 year hunt to remove me from society. Originally my brothers friend. He was also involved in the fabrications and frame jobs in my childhood life, and growing up with all the things done to try to make it look like I am and was a reckless driver based on all sorts of operations of people launching vehicle at me over and over to try to cause accidents. They succeed on one setup perpendicular to the fast lane. And when I could not stop in time and she caused an accident. She immediately got out of her car yelling. "He tried to kill me" Yet Not one thing at all in the entire situation could remotely be my fault. Yet the Police are working with worldwide support to remove me from society any way shape or form. And this is just a couple of examples. These are the some of the operations the LAPD doesn't want me talking about, hence Sean Dinse, Detective Angela Stewart and many others trying to make me look crazy and lock me away to stop me from saying anything to anyone. Officer Sean Dinse, and Detective Angela Stewart - illegal arrest Operations and Endless attempts for murder confessions on arrests with all sorts of trumped up falsified charges to try to torture me into false confessions. Even with DNA tests. The one question you might want to ask yourself about these so called murders I've supposedly been involved in? Is there even a body? Most people are normally hunted and arrested because of a crime and probable cause.Not based on complete fiction that someone might have done something from thin air. Hence, why they have called their campaign a SKULLFUCKING campaign from one of the women they sent after me on IRC who called herself Skyler (Stephanie) delivering me a message of what they were going to do to me back in about 1997. A message that they were going to make me mentally ill psychologically torture and keel me with these mass groups. Which seems to stem from a Grateful Dead Watercolor painting I did when I was 16, showed my fathers office employee Patti Googin, and told her I wanted to get a Tattoo of it. Which she said, I better not because my father would never approve of it. While I worked there in the file room making money to build my cars. Which seems odd I would be hunted over a harmless watercolor picture that no one normally could care less about. Which goes from artwork to artwork. Also, I believe right after this is when I noticed the Bullet Hole in my fathers 300e Mercedes and told him about it. Which the police have been following me since then trying to get Murder Confessions, or confessions I tried to kill or scare my father which is very strange and coincidental as well. Working with People like Eric Christianson, My brothers friend Jason Baum, Mike Wexler, Mike Huntley, and tons of others. And labels to the world I am a violent Paranoid Schizophrenic to cover up their operations to the world. Went all across the US and to Washington DC with a group calls PoliceAbuse.com to prove what they are involved in is world wide extermination campaign and Corporate is working with all location to wipe me off the planet for finding out what they are telling people world wide to Defame me, and rile the masses to kill me with endless Gang Stalking and Mental Battering all day and night 24/7 now witnessed for 16 years after finding out as it has been going on a lot longer.